Barcelona, Spain-based, global pharma firm Almirall presented new clinical evidence at the 31st Congress of the European Committee for Treatment and Research in Multiple Sclerosis (ECTRIMS) — held in Barcelona October 7–10, 2015 — supporting the efficacy of its Sativex product, currently the only pharmaceutical medicine derived from cannabinoids to treat spasticity symptoms in multiple sclerosis (MS). Experts attending discussed various aspects of the disease, including spasticity’s impact on patients’ quality of life, and the specifics of its treatment with Sativex. MS, a chronic, progressive, neurological disease, is estimated to affect more than 2.3 million people worldwide. Because the Centers for Disease Control and Prevention (CDC) does not require U.S. physicians to report new cases, and since MS symptoms can go undetected, the prevalence of the disease in the U.S. can only be estimated. The Multiple Sclerosis Society, however, continues to advocate for the establishment of a national registry to track the number of people living with MS, and has made a commitment to re-evaluate current prevalence estimates and investigate the process by which an updated estimate can be identified. According to the Multiple Sclerosis Association of America, a rough consensus estimate among some health care organizations is that some 400,000 individuals in the U.S. have MS. Nearly 100,000 Canadians have MS, giving Canada the dubious distinction of having the highest per capita rate of the disease in the world at 291 per 100,000 population — a whopping 28 percent higher than Denmark, the country with the second-highest disease prevalence per 100,000 population at 227, and nine times higher than the global average. Canada and Denmark are followed by Sweden (189 per 100,000 population), Hungary (176), Cyprus (175), the U.K. (164), the Czech Republic (160), Norway (160), Germany (149), and Austria (140), according to Multiple Sclerosis International Federation and World Health Organization metrics. The European Multiple Sclerosis Platform MS Barometer 2013 estimated that there are approximately 130,000 people with MS in Germany, 80,000 in France, 70,000 in Italy, and 45,000 in Spain. In all of Europe there are believed to be some 700,000 MS patients. More than 80 percent or roughly 600,000 of these patients are afflicted with spasticity, one of the disease’s most common symptoms manifesting as progressive and frequently painful muscle stiffness and involuntary muscle spasms that prevent sufferers from performing everyday movements, walking normally, or comfortable resting, thus having a huge negative impact on their quality of life. Spasticity affects movement or actions, which under normal conditions are performed automatically almost without thinking, requiring them to be programmed consciously because the muscles do not respond easily to nerve signals, and when they do, they fail to provide the expected response. Sativex is a oromucosal spray containing balanced amounts of the Cannabis sativa hemp plant derived compounds (cannabinoids) delta-9-tetrahydrocannabinol (THC) and cannabidiol (CBD). 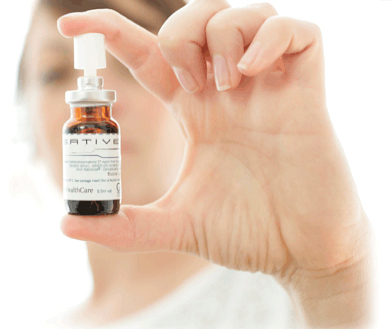 Sativex is a solution supplied in small vials as a buccal spray that the patient directs under the tongue or inside the cheeks, cautiously establishing the best dose for reducing pain through titration up to a tolerated dose. Sativex is an add-on therapy indicated to treat symptoms of moderate or severe spasticity in people with multiple sclerosis who are not responding to other antispastic treatments (Novotna A. et al., A randomized, double-blind, placebo controlled, parallel group, enriched design study of nabiximols (Sativex), as add-on therapy, in subjects with refractory spasticity caused by multiple sclerosis, European Journal of Neurology. 2011 Sep; 18 (9): 1122 31). Sativex is the first prescription medicine based on cannabinoids, and currently the only cannabinoid medicine approved to treat MS spasticity symptoms. According to Health Canada, Sativex is thought to act via cannabinoid receptors that are distributed throughout the central nervous system and in immune cells. Sativex’s exact mechanism of action in relieving neuropathic pain is not known. Among roughly one-third of MS patients suffering from spasticity, symptoms remain at moderate to severe levels despite classic treatment options. Only half of them receive specific spasticity drug therapy (Rizzo MA, et al. Prevalence and treatment of spasticity reported by multiple sclerosis patients. Mult Scler. 2004; 10: 589-595). “Sativex large studies presented today show new supportive evidence in clinical practice on the effectiveness and tolerability of Sativex as the first cannabinoid based treatment for resistant spasticity in all types of MS,” Maria Trojano, MD, Professor of Neurology and Head of the Department of Basic Medical Sciences Neuroscience and Sensory Organs at the University of Bari in Italy said in an Almirall release. During this year’s ECTRIMS Congress, new THC:CBD data were presented, including the largest observational study to date aimed at evaluating Sativex’s general effectiveness and tolerability. The Sativex AIFA e-Registry, carried out with a large population of 1,534 Italian patients with MS, showed a high initial response rate, with more than 60 percent of patients continuing treatment after the first month trial period once proving enough effect (>20 percent spasticity improvement from baseline) and acceptable tolerability. About 25 percent of these patients already showed NRS (Numeric Rating Scale) improvement over 30 percent. It also showed a clinically relevant effectiveness rate after six months, when 40.2% of trial participants reached NRS improvements over 30 percent. Other studies presented during the 2015 ECTRIMS Congress had the objective to assess the effect of THC:CBD spray on MS spasticity directly recording the stretch reflex after one month of treatment. The observed significant reduction (56%) of the stretch reflex during the therapy shows its efficacy on symptoms related to spasticity and spasticity itself (Almirall 2013 MSS Research Grant. Sativex effect on stretch reflex/Objective measurement of its effect. THC: CBD oromucosal spray effect on spasticity assessed with stretch reflex in multiple sclerosis. L.Marinelli, L.Mori, S. Canneva, F.Colobano, A.Curra, F. Bandini, E.Capello, G. Abbruzzese, T. Trompetto. ECTRIMS 2015 Abstract book). MS is characterized by an immune system attack to myelin, a substance that surrounds and insulates neurons so that neuronal electrical impulses can be properly transmitted. MS has a genetic component, but it is not just hereditary, according to the Risk Alleles for Multiple Sclerosis Identified by a Genomewide Study by The International Multiple Sclerosis Genetics Consortium (N Engl J Med. 2007 Aug 30; 357: 851862. DOI: 10.1056). MS is neither contagious nor preventable, appearing most often in persons between 20 and 40 years of age, and twice as common in women as in men. It is the most common neurological disorder among young adults. The main MS symptoms are balance and coordination difficulties, cognitive disorders, sensitivity disorders, loss of sphincter control, visual disturbances, pain and spasticity. As previously noted, symptoms related to spasticity adversely affect patients’ quality of life as they reduce their capacity to conduct daily activities and frequently affect their already damaged mobility, bladder function, and quality of sleep. “Multiple Sclerosis has not only physical consequences but also an emotional and social impact as it also affects patients’ parents, family, friends and their whole environment,” commented Mrs. Heike Borchert, an MS-Nurse with NeuroCentrum Science in Germany. In addition to muscle stiffness and involuntary spasms, in most of affected patients, spasticity causes motor clumsiness and difficulty in initiating movements, whether precision movements, such as inserting a key in a lock or moving a cup toward the lips, or more global movements, such as walking, standing firm, or recovering balance after stumbling. Furthermore, 66 percent of patients with spasticity experience related pain, 70 percent suffer from related night incontinence, half are unable to sleep well because of it, and 17 percent need some kind of assistance to dress and clean themselves following the spasticity burden.